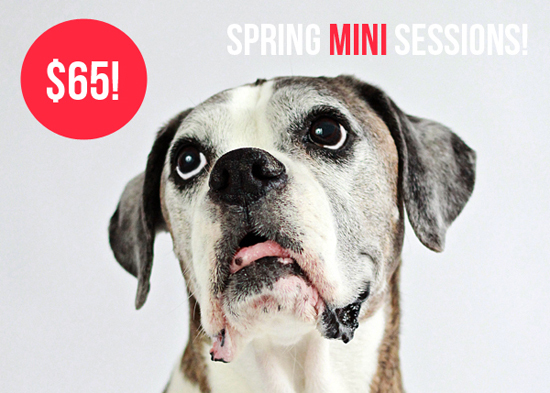 On March 9th 2014, Pawsh Studio will be hosting ‘Spring Mini Sessions’ in Toronto. These quirky yet stylish pet portraits are designed to highlight the many fresh facial expressions of your dog in a timeless, yet contemporary style. We’ve all had a very long, chilly winter this year, so I thought this would be a fun, bright way to celebrate the upcoming change of seasons! Spring certainly cannot get here fast enough! *these mini sessions may not be used for commercial purposes. Only dogs with dog manners please. All mini sessions will be photographed in the cosy comfort of Pawsh’s own studio. This is a professional working studio space. However, no flash is used so as not to startle pets and the main concern is always the well-being of the animal. Every photo session is relaxed and designed to be comfortable for the dogs. Simply email me at info@pawsh-magazine.com with “Spring Mini Session” in the subject line! Easy peasy! Let’s celebrate the wonderful upcoming season of spring, shall we? I for one cannot wait!